Lewis Hamilton drove a stellar race on Sunday to win the 100th F1 race, but here are some other talking points from the Chinese Grand Prix. Hamilton now leads the championship for the first time this season, and also his 4000th lap in the sport during the race. Michael Schumacher still holds the record with 5111 laps. The race was filled with some drama, with a couple of drivers spinning out during the formation laps, something we hardly see, but it just pointed out how technical the Shanghai circuit is, also following Alexander Albon's spectacular crash in practice three. Pierre Gasly got a point for grabbing the fastest lap right at the end of the race, much to Sebastian Vettel's dismay. Valtteri Bottas had grabbed pole during Qualifying and he was determined to win the race, however, the Finn said that he painted start line caused some terrible wheel spin. 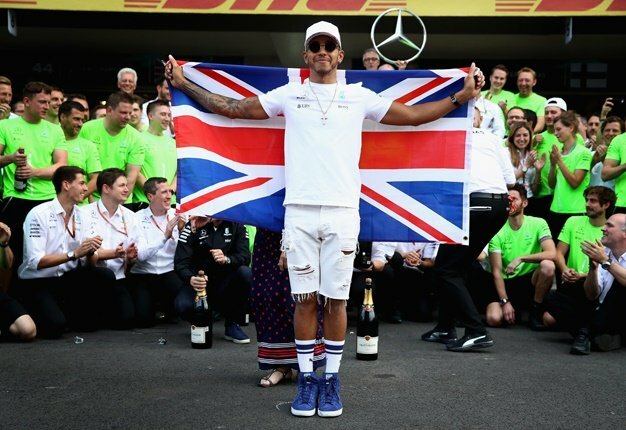 Hamilton, who had the better start, was given the advantage on a silver platter, and the Briton never looked back as he drove straight to victory. The gap between the two drivers was about five seconds when the team called Bottas in to box. His fresh set of wheels made him catch up to the race leader, cutting the gap down to about two seconds. Hamilton asked the engineers on the radio why they had given him the uppercut. Soon though, the gap grew and Hamilton cruised to victory. But we’ve never seen him make an @F1 ?? float before! Turn 1 turned out to be a danger zone for both McLaren drivers when Toro Rosso's Daniil Kvyat hit Lando Norris and sent him airborne for a couple of seconds on Lap 1. Kvyat also made contact with Carlos Sainz during the same incident, and was given a drive-through penalty. F1.com reported Sporting Director Gil de Ferran said after the Chinese Grand Prix, "racing can be very cruel sometimes, and today it was." Charles Leclerc has set the bar so high for himself by grabbing pole position so early in the season. What would have been his first race win turned out disastrous when his car suffered some mechanical failure. It made us believe Ferrari would give its new driver equal opportunity as to team mate Sebastian Vettel, and the two would be allowed to race. The Chinese GP proved we were all wrong. Leclerc seemed the faster of the two and was ahead of his team mate, albeit Vettel being the fastest during the first practice session. Yet, Lecerc was given the order to allow Vettel to pass. This gave Max Verstappen the uppercut and allowed the Red Bull driver to steal fourth place from the young Ferrari driver. Red Bull's Max Verstappen and Ferrari's Sebastian Vettel were duelling in China once again. Almost a year ago to the day, the two drivers went wheel-to-wheel and they both spun out in the Chinese GP, sending the further down the grid and losing their front positions. This year though the drivers kept it tidy and showed us some proper racing. Thai driver Alexander Albon's weekend looked like it would shred to nothing before the race even began on Saturday when he hit a wall during the final practice session. The Toro Rosso driver had tot sit out qualifying as the team repaired. On Sunday, Albon started the race from the pits, drove his car through the field, and finished the race with some points in tenth place. He went on to get grab Driver of the Day award for his stellar performance and for keeping so unbelievably calm. He is one of the only new young drivers to have scored points in two of three races of the season. WATCH: What's going on with Kimi Raikkonen in this video?